items, masteries, runes, early, middle and late game. In the current meta of team fight oriented LoL where most top laners are chosen for their team fight potential and ability to make a massive difference in mid game objectives (think Kennen’s ultimate “Slicing Maelstrom” or Rumble’s “Equalizer”) There exists a champion with a different idea of how to win the game, that champion is Kayle. If you like the idea of becoming a raid boss who at a certain point of the game views the enemy jungler as a buff delivery system then Kayle might be the champion for you. In order to properly play Kayle, it is important that you really understand the limits of the champion that you are playing as well as how to properly play top lane in the first place this will be a crucial piece of this guide as it will ensure that no matter what ELO you are before reading this guide you should have no trouble climbing the ladder rank system. Kayle is one of the strongest top laners in the meta currently in solo queue, she has maintained a top 5 win rate in the top role and jungle role for many patches despite having a low play percent ~1-2% this means that despite being one of the strongest champions in the game, the general communities perception of her is not very high, the best reason I can think for this is due to the fact that she does not get any LCS play and solo queue players are not able to see the full potential of what Kayle can do, In season six I took advantage of this hidden OP pick and was able to climb to Diamond while maintaining a 67% win rate on this champion. WHEN SHOULD I PICK KAYLE? There are many different matchups that I readily pick Kayle into, we’ll go into these more in detail in the counters section of this guide, but generally speaking Kayle is safe into most tanks and bruisers in the top lane and once you are more familiar with this champion you will feel confident in first picking her as well. As a Kayle main your goal is to become an unkillable monster that laughs when the enemy jungler tries to save his teammates failed lane and laugh at the despair and rage that no matter what they try there is no way to stop you. That being said you must also realizes that Kayle does not have the strongest early game and does have some exploitable weaknesses, which is why it is important to follow the next steps in the laning phase. How you play the early game is very dependent on your lane matchup as well who the enemy jungler is, but before we get into that I will define some of the basics you need to be aware of that will apply to all lane matchups you need to go against. You want to get 1 minion lower HP then the other 2 so that you are able to CS all of the minions, after you do that wait for that minion you attacked earlier to get low enough to last hit and then activate your “E” ability “Righteous Fury” to last hit the melee minions 1 by 1, after that your E cooldown will run out, you may have to make the decision to melee auto attack a caster minion in order to secure the last hit and to successfully CS the entire wave, if you are up against an easy matchup you should be fine doing this but be weary it might not be worth it to take harass against certain opponents. At this point of the lane your goal should be to pull the wave towards your turret for the first few levels, by doing this you will ensure that you are safe from an early jungle gank, typically speaking if the jungler follows a normal route he will get a leash from his AD Carry and Support and will proceed to get his two buffs and then gank top. All of this happens at level 3 which is very early in the game you need to know that this is a possibility and play accordingly which means pulling the minions closest to you otherwise you risk blowing your flash cooldown to survive or worse giving up first blood and having the enemy top laner ask you how the dirt tastes in all chat. The ideal scenario to get a very good trade during laning phase is to capitalize on your opponents mistakes let’s take a champion like Ekko for example if you Ekko uses his “e” ability Phase Dive in order to secure a Cannon minion you can take advantage of this if you still have all of your cooldowns up, as soon as Ekko comes in range use your Q ability to apply a stack of your passive and to massively reduce his move speed and then activate your E to get as many auto attacks off as possible, If you want to be pro then also remember to anticipate your opponents next move which in this case it would be highly likely that enemy Ekko after realizing that this will be a bad trade for himself will attempt to throw his Q ability “Timewinder” to slow you down to stop your harass, it’s possible to use Kayles W ability in order to give enough move speed to side step Ekko’s ability which could either force him out of lane, blow his flash, or give you the kill. Kayle loves extended trades where she can reach her maximum damage by taking advantage of stacks on her Fervor as well as her passive. Since Kayle is ranged it means that she can only apply 1 stack of fervor at a time, however if you attack a minion with your e and the splash damage hits the enemy it applies a stack of fervor. Try doing this as many times as possible and then moving in when they move in to CS using your abilities to maximize your damage output, if you are able to make it to 8 stacks of fervor you will be hitting for massive amounts of flat damage just from the mastery and cutting through 15% of your targets Armor and Magic Resistance and all of this happened due to your opponent not realizing that these stacks were being applied due to the fact that the splash damage is so small, but it is small victories like these kind of trades that snowball into a won lane and possibly a win. The ideal first back buy is berserker grieves and a 2nd Doran’s ring, if you managed to last hit minions better than the opponent and were able to buy these items into an “easy” lane then it is at this point that you can really start bullying your lane opponent and applying absurd amounts of pressure through the top lane emphasis on absurd. Let’s talk about the items first. After hundreds of games of Kayle I’ve found that berserker grieves are actually a better first item then stinger they both give 35% attack speed but I believe having +45 movement speed is superior to having +10% cooldown reduction as it allows you to get more auto attacks off, the 2nd Dorans ring is important as well since you will slowly run out of mana if you only have 1 and the bonus stats on a Dorans item help you become a bigger lane bully. Once you get back to lane play safe at first until you know where the enemy jungler is, once you know that the enemy jungler is not a threat and will not gank anytime soon it’s time to play aggressive, this means that while the wave is in the middle of the top lane you CS the minions as quickly as possible and take every opportunity to harass the enemy top laner (assuming you are playing anything except for a hard or very hard matchup). Pro tip: you can kill all 3 minions quickly by autoing from left to right and ending in the middle as opposed to mindlessly auto attacking one minion with your “E” activated. Forcing the enemy to farm under his turret is one Kayles major strengths, she is without a doubt one of the fastest pushers in the game and if you abuse this correctly you force the enemy top laner to act irrationally and make mistakes that they normally wouldn’t under less pressure, the longer you do this the bigger advantage you can accumulate due to many top laners being unable to last hit effectively under turret One example that comes to mind is Kennen. Kennen is a strong top laner without a doubt but he should get beat by a good Kayle player if there is no jungler intervention. After level 6 you can shove Kennen under his turret and he will be unable to last hit all of the caster minions because his auto attacks do not have enough damage on them to secure the last hit. So every wave of 6 minions that come in you will be denying him at least 1-2 minions and then he has to choose between farming and taking harass and potentially being forced out of lane, the only other option is to attempt to all in Kayle which also will not work since your ultimate will cancel out the majority of his. As a Kayle player I usually always get first turret blood in most game because of the constant shoving I am allowed to do, in a patch where the 1st turret is worth 600 gold and the team who takes the first turret has a 70% chance of winning I think you can see how this is effective. The first big power spike you get as Kayle is when you are able to afford your “Guinsoos Rageblade” if you can get this item before the enemy top laner gets his 2nd item then there is a good chance you may be able to 2 v 1 the enemy jungler / top laner. During the mid-game I usually choose to split push for their 2nd tier top turret, if my team is playing correctly this is when they will group as 4 to siege. What this does is it forces 1 member on the enemy team to come up to the top lane to stop the split push but if they stop the split then it is now a 3 v 4 in favor of my team in the mid lane. This also means that my team will also have dragon control if it spawns. If they don’t stop the split push then my team gets a free turret and extra gold and map pressure that comes along with it. Continue to use these same tactics to apply pressure in whatever way you can. When I’m shoving top lane I also make sure to counter jungle whatever I can from the enemy jungle to rob them of gold for example, blue buff is also very easy to take as Kayle. Split pushing is a good option but also remember not to be reckless if the enemy top laner won the laning phase and you did not you are most likely not as strong as him and may need group with you team to make plays, also know when the time to split push is, you do not want to split push I your team is not grouped and pushing a lane, to split push properly you absolutely need pressure in another lane. Often times once you master Kayle you are able to force the enemy team to surrender at the 25-30 minute mark, but if not then that is okay Kayle is one of the best scaling champions in the game. I like to typically wait for my “Runaan’s Huricane before I group with my team. Even though Kayle has splash damage built into her “E” ability you are not really a team fight monster until you are able to purchase your hurricane, the synergy between Kayle’s passive along with fervor and Runaan’s bolts creates a lot of AOE damage in team fights, at this point of the game your role is basically a secondary AP ADC, as for ult usage I usually like to use it for myself the only time this differs is if you have a mid or ADC who did absurdly well in which case you can ult them if they are in danger. Goddamn archangel. Mr. M1nt, i see that you played a lot as Kayle, so i expect a really hi-quality guide about this winged fella. upd: Well well well, my expectations were met perfectly. 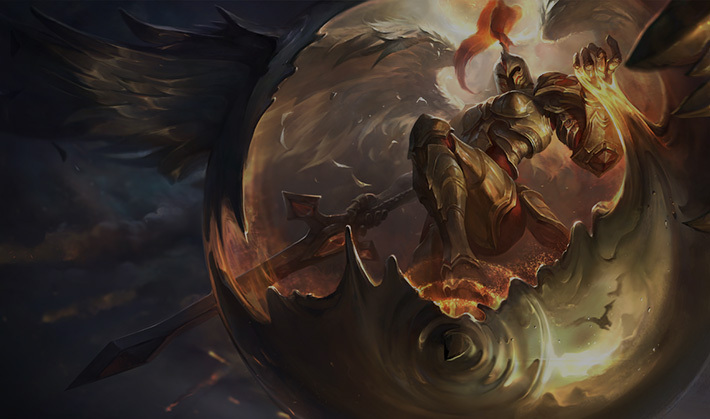 A detailed guide about Kayle, absolutely all of his advantages were highlighted correctly! Excellent work buddy!